Part of the Asian Jungle Collection from Betsey Johnson™. Let these wondrous Peacock earrings create the perfect bohemian-chic ensemble! 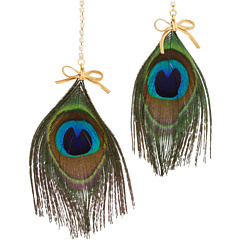 Peacock feathers hang delicately from gold-tone bows and rhinestone posts. Betsey Johnson’s childhood aspirations to be a dancer and her love for costumes laid the foundation for Betsey’s creativity and inspiration, which is still evident in her designs today. New York designer Betsey Johnson has built her long-standing career in fashion by following her own set of rules. Known for her celebration of the exuberant, the embellished and the over-the-top, Betsey Johnson shoes, Betsey Johnson jewelry and watches, Betsey Johnson clothing, Betsey Johnson handbags and Betsey Johnson eyewear has been rocking the fashion industry since the 1960’s. Her commitment to remain true to her one-of-a-kind vision has afforded Betsey continued success in an industry known for its fickleness.